Does Picasso paint Toronto’s bike lanes? You might think so when comparing the $11 million in capital spending on cycling last year with the 8.5 km of bike lanes that were actually created. Following the money offers a better, even if less satisfying, explanation. The bottom line is that only 11.5 percent of last year’s spending (plus some amount for painting the lines) from the cycling infrastructure budget went to what most people would expect from such a budget – new bike lanes. In the spring of 2016, community advocates fought hard to secure $16 million in annual funding for cycling infrastructure. At the time, there was hope this higher funding could accelerate the Bike Plan’s ten-year timeframe for the 335-km of anticipated new bike lanes (including sidewalk level paths). So how did we get so few bike lanes from the $16 million capital budget for cycling – of which $11 million was actually spent? The question isn’t simply academic. Toronto’s bike infrastructure falls far short of cities like Montreal, where 90 km of new lanes were installed over the last three years alone. In fact, forty years after our first bike lane, there are bike lanes on a mere two percent of Toronto roads -- and we’re still a long way from having a coherent bike network. The lack of progress is disturbing for a year when there were five cycling fatalities – a toll not exceeded since 1998. In 2018, only $1.26 million (11.5 percent) of the $11 million of actual capital spending went to installing new bike lanes -- the 8.5 kilometres documented in a previous article. Some additional amount (likely in the range of a few hundred thousand dollars) was spent on painting the lines. 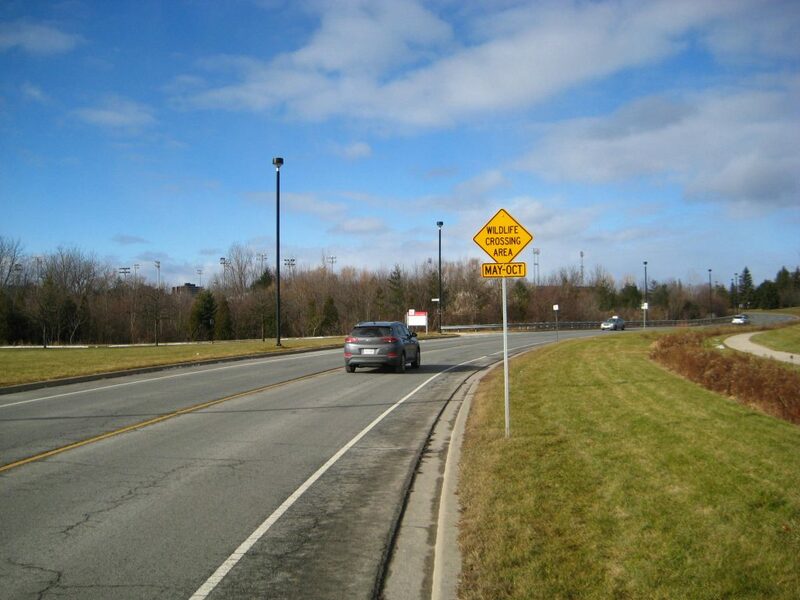 New bike lane installed on Shoreham Dr. in 2018 above. Can the $5 million in the unspent 2018 budget be carried forward to 2019? According to city staff, some portion of last year’s unspent capital funds might be carried over for projects that were already underway last year. 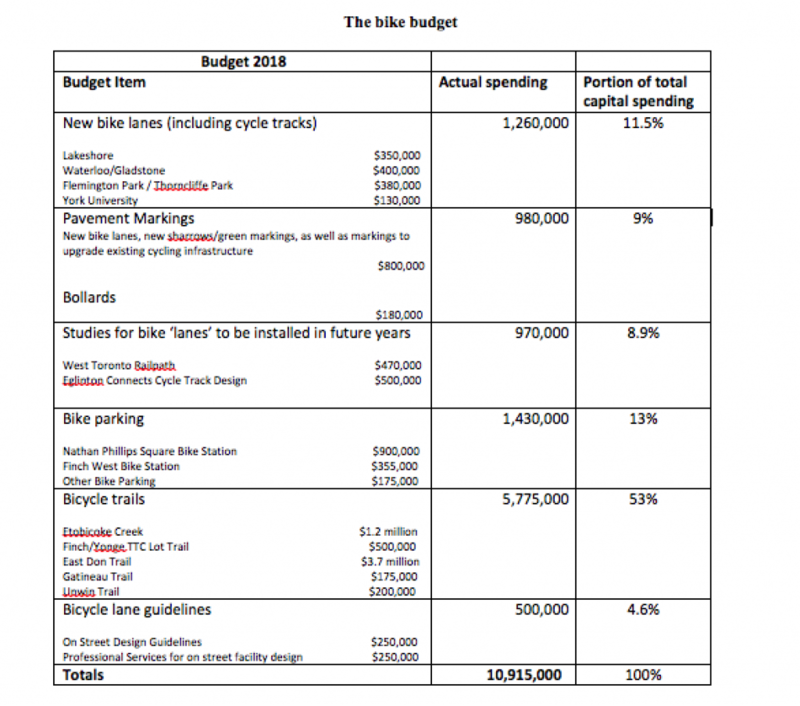 As well, the city’s cycling budget is augmented by $20 million from the federal Public Transit Infrastructure Fund (PTIF) – money that has to be spent by the end of next year or risk being lost. In short, it doesn’t look like money is the problem. When the approximately $1.26 million spent on bike lanes last year is added to other dollars that are plausibly related to on-road infrastructure, the total still doesn’t reach 30 percent of actual capital spending. These additional amounts include design work for future bike lanes (we’re including the West Railpath because it would be useful to commuters), ‘pavement markings’ (some portion of which was for bike lane upgrades), and bollards. The point isn’t that City Hall should never spend on ‘soft’ initiatives like parking, sharrows, guidelines, or trails but the priority must be the everyday cyclist – indeed, no one should be surprised if City Hall will be judged based on how many new bike lanes are installed -- precisely what the Bike Plan was supposed to deliver. New "bike lane" on Dovehouse Ave installed in 2018 above. Last year’s capital spending on bike lanes is absurdly out of whack with spending on items that should be adjuncts, not priorities. The imbalance might be treated as an anomaly, but for the fact that we’ve seen it all before – over many years. Indeed, the current Bike Plan has troubling parallels to the failed 2001 plan. In each case, the plan was preceded by a few years of intense study (requiring significant resources), then the announcement of a major bike plan, and followed by a lack of action. Curiously, despite an apparent lack of staff resources to oversee capital projects, City Hall’s Cycling Unit still has a number of unfilled staff positions. Cyclists might take at face value assertions from City Hall that Bike Plan spending is ramping up, and great things are soon to come. Unfortunately, we’ve been hearing similar things for years. The city is forever turning the (same) corner on creating cycling infrastructure. The lack of political accountability for cycling plans remains a key problem. In May 2016, Councillor Jaye Robinson, head of public works, said the new Bike Plan would not repeat the mistakes of the old plan. 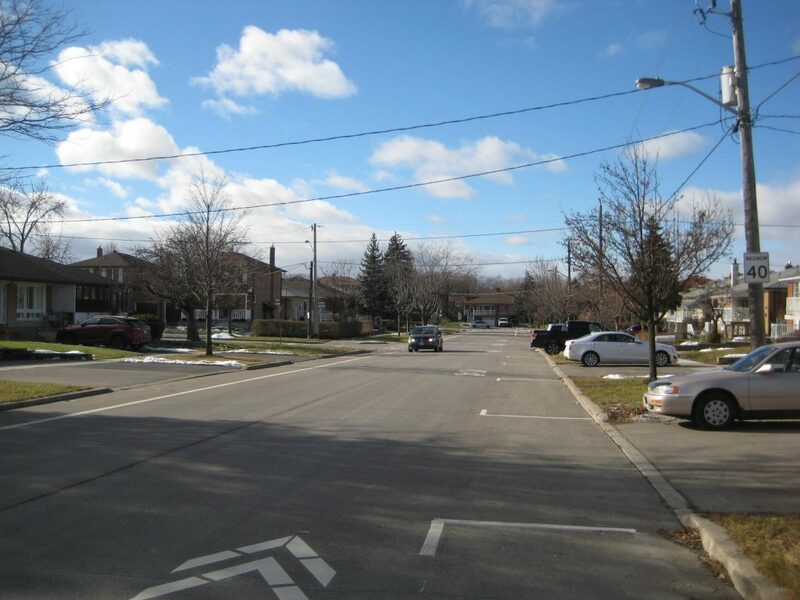 She said, the $16 million budget “shows a strong commitment to the cycling network.” She nonetheless succeeded on a motion to put on hold 6 of 8 studies for key connecting routes along roads like Danforth. The idea was to first learn from studies that were apparently underway (“locked and loaded,” in the words of Robinson), with a review before the end of 2018. Instead, we got more of the same: about eight km of new bike lanes in each of 2016, 2017 and 2018, inaction on a key study supposedly underway (for Bloor), and the failure to conduct the two-year review. Robinson has, not surprisingly, moved on to another portfolio. Picasso is dead, and so too will our Bike Plan if the public doesn’t start getting value from dollars dedicated to bike infrastructure. Asking cyclists to admire beautiful bike plans is no substitute for getting real bike lanes under our tires. Albert Koehl is an environmental lawyer, road safety advocate, and founder of Bells on Bloor.